If you ask any Kansas City Chiefs fan what the focus heading into 2019 should be, there is a resounding answer – improve the defense. More specifically, the secondary stands out as an area that needs some reinforcements. The Chiefs had just two secondary members grade above 70.0 (Kendall Fuller at 72.4 and Steven Nelson at 72.1), and Nelson has since agreed to a new contract with the Pittsburgh Steelers in free agency. With standout safety Eric Berry playing just 266 defensive snaps in the last two seasons, the Chiefs felt that it was time to add another high-level player at the safety position. Enter the Honey Badger. 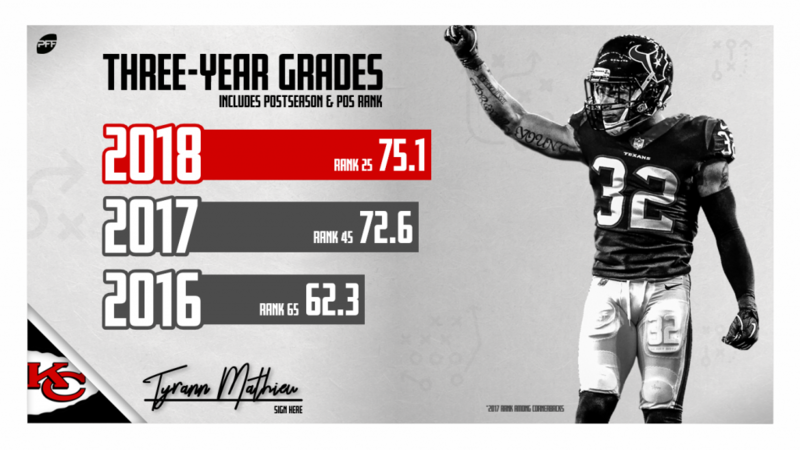 Tyrann Mathieu’s tenure in Arizona was slowed by injury at times, but when healthy, he showcased top-level talent, highlighted by a 90.7 overall grade in 2015. Last season, on a one-year deal with the Houston Texans, Mathieu recorded a 75.1 overall grade which ranked 21st out of 93 qualifiers at the safety position. That grade came on his second straight season with 1,000 or more defensive snaps – the only two times in his career that he played at least 1,000. 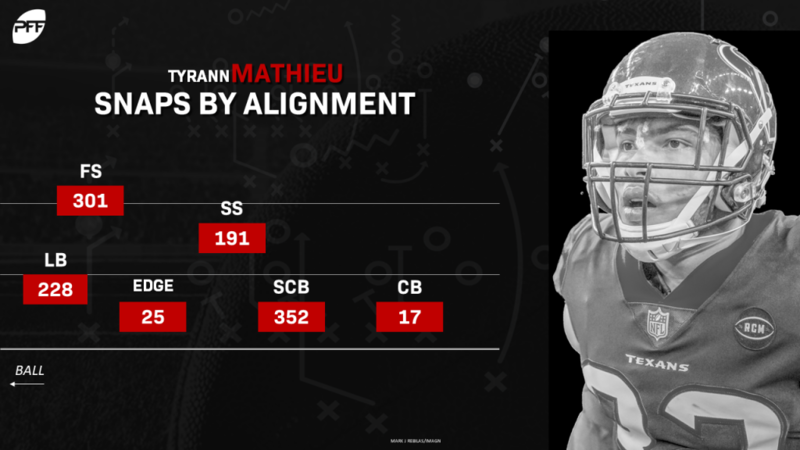 One of the more unique aspects of his game, and likely one of the reasons that the Chiefs had him as the top safety available on their free agency board, is Mathieu’s defensive versatility. The Honey Badger played at least 300 snaps each in the box (419), as a slot corner (352), and at free safety (301), and as his overall grade would suggest, he played well enough in all those roles to finish the season in the top 25 percent of all safeties around the league. That kind of positional fluidity will allow the Chiefs to move him around based on situation or matchup – a valuable commodity in today’s NFL. When in the box, Mathieu displayed proficiency against the run with an 83.9 run-defense grade that ranked fifth at the safety position. That is a welcome sight for the Chiefs, who struggled to defend the run all last season. In the regular season, the Chiefs allowed 4.95 yards per rush attempt (when you exclude quarterback sneaks, kneels, reverses, jet sweeps, etc.) and that ranked second-worst in the NFL ahead of only the Cincinnati Bengals. Though Mathieu won’t be mixing it up in the trenches every play, adding a solid run defender can only help that cause for improvement. Mathieu serves as an upgrade in coverage for Kansas City, as well. In 2018, his 70.6 coverage grade ranked 38th out of 93 qualifiers at safety. He was targeted heavily – his 70 targets against were third-most among all safeties – but he held up relatively well to that heavy fire. Though he allowed a passer rating of 112.4 into his coverage, Mathieu ended the year in the top five at the position in forced incompletions (8) and total stops in coverage (18). Put all of that together, and the Chiefs got a well-rounded, versatile defensive weapon to add to their secondary – an area that sorely needed some reinforcements. As long as Mathieu can stay healthy, which he has done for the last two seasons, he’ll be able to match up in the box, in the slot, or deep at free safety for the Chiefs. With the high-flying offense from last season remaining mostly intact, an improved defense would come with Super Bowl aspirations in Kansas City. That’s what the Chiefs are chasing, and the addition of Mathieu is a step in the right direction.